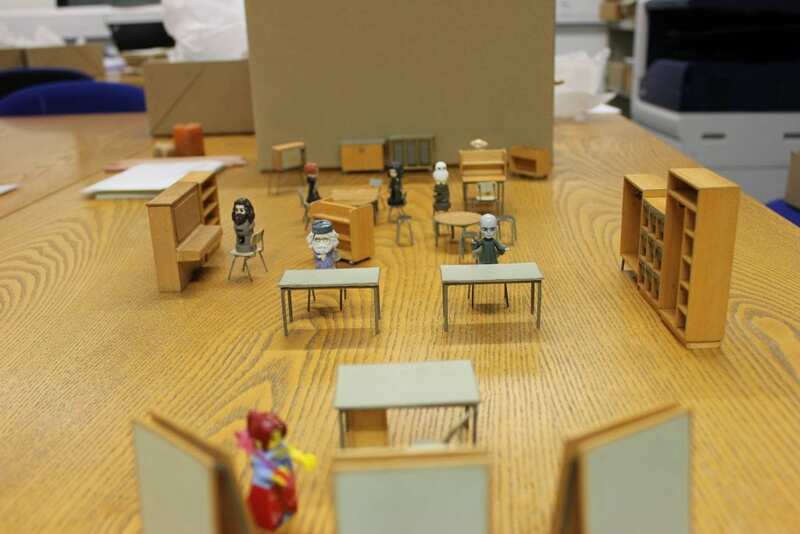 This is a guest blog post by one of our archive volunteers, Sara Abou El Ella, who was working in the IOE UCL Archive department with items from the collection of David and Mary Medd. blog post by Sara Abou El Ella. For a few weeks now, I have been busy cataloguing and sorting scale models of school furniture used by David and Mary Medd in 1976. They were at the forefront of public architecture and design and created an inextricable bond between architecture and social progress. This archive project required particular attention and care since many of the furniture pieces were detaching from their main bodies. Despite this, I enjoyed unpacking all the objects and grouping them together, since many of them were spread in different boxes and they had never all been itemised. I would say that a particular challenge involving this project was comparing all objects to the furniture handbook. Some of them presented very similar characteristics and appearance making them hard to locate in the handbook and some of the objects were not listed therefore I had to catalogue them separately. After this very rough introduction, I would like to give the readers a taste of a typical day volunteering at the UCL Archives. I arrive around 1.30pm and stay until 3.30pm or 4pm. This project required more attention and time to be dedicated to it. 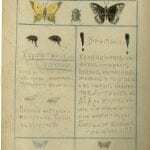 The first task is to gather the special conservation paper sheets to protect the objects. On my first day, I read a book written by Catherine Burke to become more acquainted with the project and with the architects. Secondly, I carefully read the index and catalogue in the handbook to compare the numbers, characteristics and type of every object which should be contained in the collection. The third task, the most crucial and important of the project, is to open all paper wrappings in the different boxes, group together all items of the same nature and write their number, short description and wrap them all individually for better conservation purposes. One of my favourite objects was the reproduction of a small piano and wardrobes which had little hangers attached to them. For this blog I tried to recreate a small classroom and include some of the most iconic pieces of furniture present in the collection. Because of the small damage and the rust which accumulated on the objects I hope to volunteer with the UCL Special Collections Senior Conservator to clean and conserve this collection. This is a very exciting opportunity to improve the access to this archival material and be able to present it to different researchers and for object handling sessions in schools. The definition of ‘Christmas Box’ from the 19th century dictionaries is ‘a box for collecting Christmas presents; a Christmas present’ (1885). Christmas as we celebrate it today has its origins in the Victorian period, thanks to Prince Albert bringing to England the German tradition of a Christmas tree lit with candles. By the end of the 19th century, the Christmas tree was a familiar sight in the homes of many well-to-do families and the joy of opening a Christmas box part of the excitement of the festivities. 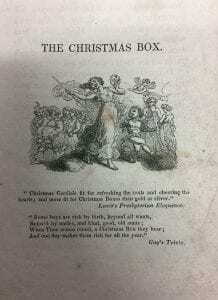 One of the children’s books in the Baines Collection held in the UCL Institute of Education’s Special Collection is an annual (the first for children published in England) with the title The Christmas Box. As the title is so relevant to this time of the year I would like to share the delight of this little book as a Christmas treat for everyone. The book, edited by T. Crofton Croker, is small in format as was typical of children’s books at the time so that they could fit in a child’s hands. 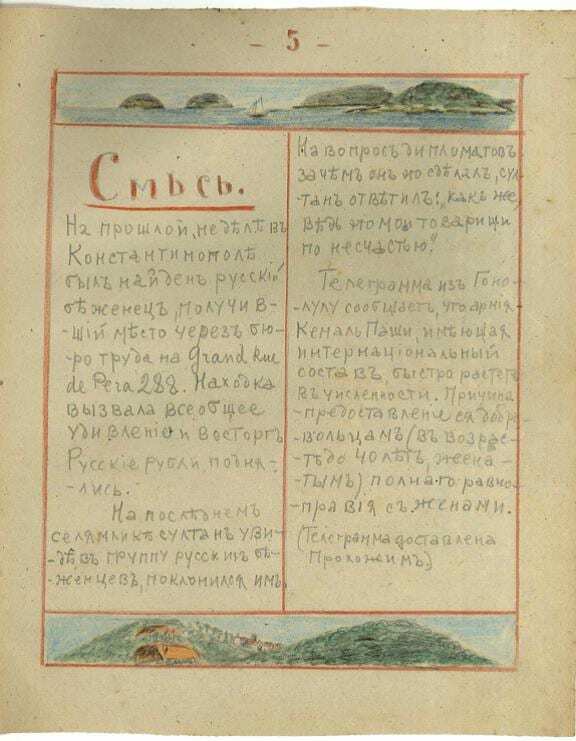 It is only 16.2 x 10.2 cm in size and was published between 1828 and 1829. It has lovely wood cut prints and includes short stories, verses, plays and articles and even a brief history of the Napoleonic wars. 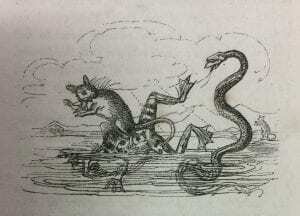 The stories include ‘Battle of Frogs and Mice’, a short animal epic ascribed to Homer in the ancient world and ‘The Three Caskets’ which was used in Shakespeare’s Merchant of Venice. The book also contains a couple of firsts: the first appearance of a Norwegian folk tale ‘The History of Asim and Asgard’ and the first publication of Scott’s poem ‘The Bonnets of Bonny Dundee’ (Hahn, 2015, p. 127). In addition, there are writings by the prolific author of adult and children’s stories Maria Edgeworth (1768 – 1849) who also wrote the well-known education treatise Practical Education (1801) (also in the IOE’s Special Collections) in which she and her father Richard Lovell Edgeworth combine ideas of different philosophers including John Locke and Jean-Jacques Rousseau. and to thank you for your patience in perusing our small present. and be ready, when we meet again, to glance over our pages with the same good humour and glee as we trust you have done. Have a lovely Christmas and Best wishes for the New Year! The Newsam Library at the Institute of Education has a large collection of education institutional histories. These form a discrete collection and provide a rich source of information on individual schools, colleges and universities and their communities across Britain. The books and pamphlets mainly date from the early twentieth century up to the present day. Older materials, dating mainly from the nineteenth century, are held in the History of Education Collection in the closed stacks. 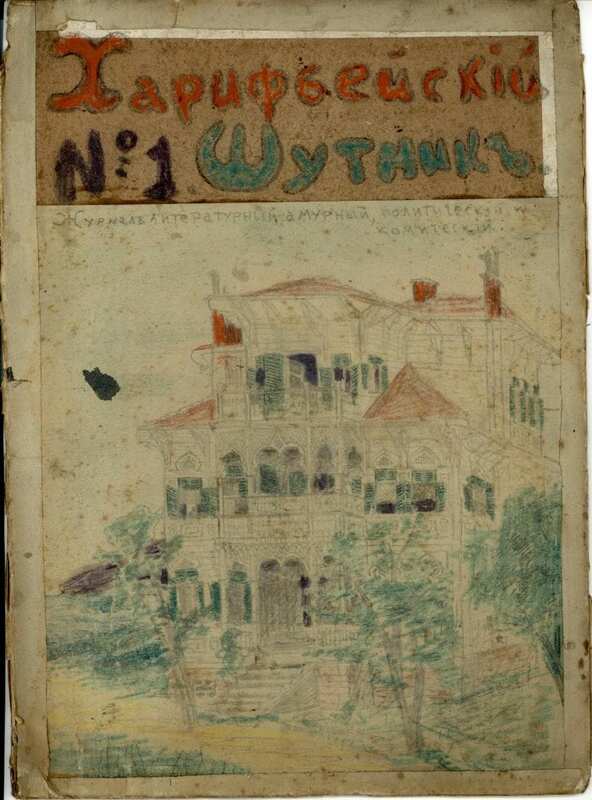 This post focuses on the school histories which make up a significant part of the collection. 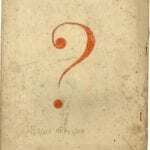 In anticipation of the half-day symposium on writing institutional histories, jointly organised by ICHRE (International Centre for Historical Research in Education) and FNLA (Friends of the Newsam Library and Archives), we present a guest blog by Dr. Barry Blades on his use of the IOE’s School Histories Collection to write his book, Roll of Honour. Blades, B., 2015. 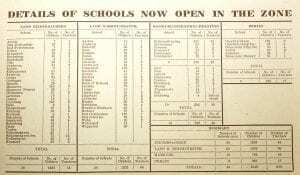 Roll of Honour: Schooling and the Great War 1914-1919. Pen & Sword Military, Barnsley, South Yorkshire. 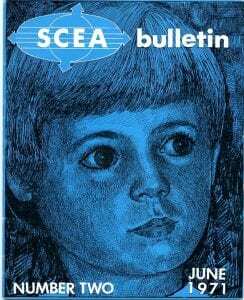 The School Histories Collection consists of hundreds of monographs of individual British schools, covering a range of institutions spanning the educational spectrum. The voluminous histories of elite public schools stand next to brief studies of charity schools for waifs and strays. Publications marking the centenaries of ancient grammar schools are shelved next to accounts of elementary schools which no longer exist or have been absorbed into other institutions. A school’s place in the hierarchy of schooling is generally mirrored by the status of the publishing house which was commissioned to tell its story. Many of these histories – the vast majority relating to English, Welsh and Scottish institutions – were written by alumni: former pupils, teachers (especially retired Deputy Headteachers) and governors determined to place on record the distinctive development and particular achievements of their alma mater. It is easy for the outsider to criticise the esoteric, celebratory and partisan nature of these histories. The great majority were intended primarily for the school community itself. Few beyond the immediate community would identify the school in question from headline titles such as Where the Fat Black Canons Dined, Further Up Stephen’s Brae, or Hyacinths and Haricot Beans. Subtitles were generally more informative. These histories were aimed predominantly at a readership already familiar with the institution, namely the ‘Old Boys’ or the ‘Old Girls’. An institutional history might cover hundreds of years, but in most there will be at least one section for the alumnus which refers to their particular period of attendance and school life as they experienced it. Headteachers inevitably dominate the story. The tenures of these deified – and very occasionally demonised – individuals commonly provide a chronological structure to a story of growth and development. Teachers, and especially those with nicknames deriving from their idiosyncratic mannerisms or behaviour, are fondly remembered. Heroic deeds on the playing field and battlefield are fixed in print and validate memories of achievement and loss. Narrative triumphs over analysis. Yet, what may at first appear to be the greatest weaknesses of published school histories is, for the historian investigating the history of education more generally, their greatest strength. The rich detail, the human stories and the relatively obscure anecdotage contained therein tell us so much about the ethos, culture and formative traditions of individual institutions. These ‘secondary’ sources thus become a form of ‘primary’ material when the researcher asks questions relating to continuity and change and similarity and difference in any given period or aspect of schooling. Many of the histories were, of course, constructed using primary sources, their authors making full use of the archive material still retained by many institutions. 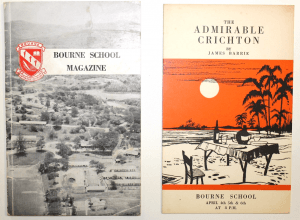 School logbooks, magazines, headteachers’ annual reports, governors’ minutes, the records of alumni organisations, and ephemera including school photographs and fixture lists are the real archival treasures upon which these broader accounts are based. 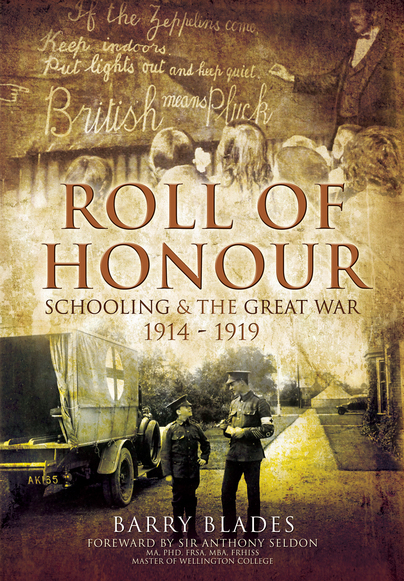 Roll of Honour, the first book in the Schooling and the Great War trilogy, includes material from over one hundred such histories and drew ideas and inspiration from many more. Wherever possible I used extracts which were evidently drawn directly from the institutional archives. Other material was subjected to the usual tests of authenticity, accuracy and reliability. School histories vary considerably in their coverage of national events. This was particularly noticeable when searching for references to the Great War of 1914 to 1919. A few histories cover the wartime years in detail. In others, there is little or no reference at all to the impact of the war on the daily life of the school or even to the conflict in general. In many, the wartime experiences of alumni take centre stage. Taken collectively, however, these histories formed a major component of my research; an evidence base which could be cross-referenced and triangulated with material from other archival collections, official publications, newspapers, contemporary autobiographies, printed secondary works and digital resources. 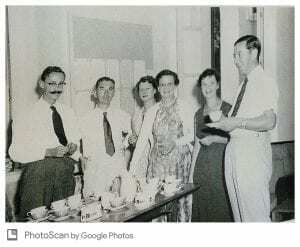 For the researcher who wants to find out more about how different institutions created, developed and maintained their distinct cultures and particular identities, then dig deep into the School Histories Collection. For the researcher who wants to discover how institutional imperatives tempered directives from national and local authorities, or how schools responded to national and local economic and social circumstances, then test your hypotheses in the School Histories Collection. For those of you who are historians of the school curriculum, or teachers and teaching methods, or pupil origins and destinations – or indeed any given period or particular aspect of British schooling – I can assure you that delving into the School Histories Collection will be most rewarding.